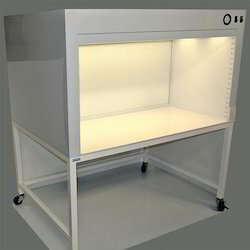 Glowmax Engineers are successfully engaged in offering a commendable Vertical Laminar Air Cabinet. We are reckoned entity of this domain engaged in offering an enhanced quality Laminar Air Flow System. Laminar Flow ultraclean®Laminar Flow ultraclean® operates with vertical, low-turbulence displacement flow and fulfils the requirements of purity class 5 as per ISO 14644-1 in working areas. There is permanent overpressure under the cleanroom unit, which prevents particles from entering into the filling or working area. Aircon is specializing in this field providing absolutely clean and strike environment to you through their systems namely laminar Flow Workstation.